Facebook has been the most well used strategy for advertising your business. Facebook users are engaging with the Ads and the rate of engagement has grown 11% over in just 6 months. They also announced that it reached 1 billion online users just before months (start of this year 2013) . The strategy is that its user interface is highly attractive to any kind of people may be even to the ones who have just started using it. As we know, to promote our business we all would create facebook business pages where we keep on sharing updates to keep our crowd (people who have liked your page) updated on everything about the business. It might sound easy and stressless overall when you hear its all about sharing updates frequently and you may say "Well, I could do that sharing and blah blah blah". But guys, its more than just sharing. I agree sharing is an important part and it might be easy as some of us feel too, but there's something you should worry about. "The Crowd". That's what I'm talking about. In this post, I am going to tell you the advertising techniques that the social media freak Facebook has provided to your efficient use of marketing your business. You can able to create a Facebook Ad only if you have a business page. Facebook ads differ in cost as per your need. Struggling to find the crowd? So, where will you find your crowd?. Going on asking your friends and followers to like your business page is a good idea. But, even it seems little dizzy when you think of the long time maneuver. You can't keep on asking the same guys that you've been asking all long. Its better to get recognized over to many people and getting more likes per day or per week. If you have a business page, you might notice your page's growth through the Facebook Insights. At the start it always feels like you haven't got into much likes per day. Some might loose the interest in sharing posts on their page because of less listeners. It takes some days to get into the market. First of all, having in mind what exactly your business is, know what needs to be put into work to make it gain more listeners. 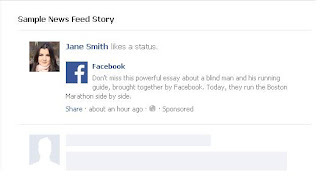 Facebook has provided the advertising of your pages on a manner as "Sponsored". This sponsored pages have the priority that stands out to other business pages in every aspect. When you know what exactly your business needs, you'll also know how to do it. The Point of using this advertising strategy is that you may have seen on your wall where when your friends like some pages, it is shown Sponsored at the end along with the total likes or may be with a recent post from that page suggesting you should consider liking the page too. This is called Sponsored Stories and Ads on Facebook. And this functionality costs a bit low considering the advantages that you get by using it on your business page. Is it Building an Audience? Regular Ads, ie) Premium Ads are the ones that you might have seen on the right side of your facebook homepage. 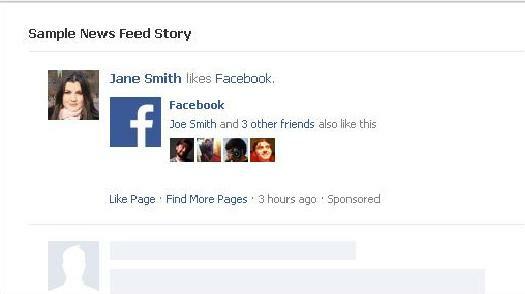 This is kind of letting people know that how many have liked the particular page and suggests them to like it too. Its your selection that gets displayed as the headline, text and image and also where you want them to enter into first. Sponsored Stories are the ads that will help you get more audience through your friends. People will see these ads in their news feed when their friends like the particular page. It suggests the user to like it too, and the logic is that you might like it too as it is indirectly suggested by your friend. It is a best option to get discovered through your friends who have already liked your page. This mode of advertising is best suited for the new start-ups to gain more audience that would actually listen to the business. Getting discovered is one main hassle for every start-up business pages on Facebook and this ads will make it easy within a short span on its own. Or do you choose Engagement with your present audience? Engaging with the people is a better one considering if you have better things to show off with like getting more likes and shares to your posts. Facebook Engagement have grown 11% in just 6 months. This means you gotta be in that list of people who use this service too. Note that your post updates should be more interesting to the crowd as much as they want to comment, shre and like your posts and always keeping in touch with your business. The Regular Ads from page posts are the same as like the regular ads that we have discussed earlier and the speciality is that it displays a specific post from your page and displays on the right side of the user's facebook home. And you can select which post to be displayed whatever it may be that you want your users to see and interact with. It may be either a video, image or text anything. It is best for sharing great content, promoting a specific post or a product. Like we discussed earlier on the sponsored stories, it displays the posts that your friends have liked on a business page. 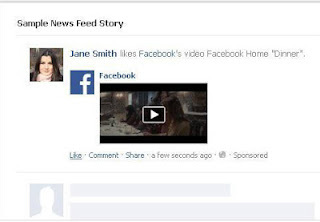 When you do use this Sponsored stories from page posts for your business page, users will be able to view the posts or status or any content that their friends have liked on your business page. It is targeted mainly on the existing friends or fans to your page and let them interact with the posts by sharing or commenting on it. Interaction is only possible when you have a interesting topic to talk, share about. So if you believe your business page has such interesting quality posts you could make use of the Sponsored Stories from the page posts. This option will produce a sponsored ad with the latest post and tempts the users to comment, share or like it as once they see them. My advice is if you are just started your business and want to advertise on facebook, you should go on with the first set for Building the audience and once you're settled with a decent number on the crowd, you may try out the Engagement set of advertising options. Now let me know what you are targeting (Audience or Engagement) and what advertising option would you possibly choose for your business below on the comments. Thank you for the awesome tips and info and I just want to share this. I have read many of the articles here and these are among the best information.